- The upcoming Jawazat website will serve and help the millions of Saudi citizens and expatriates living in the country, So you can share the problems currently people are facing so that it can serve you better. 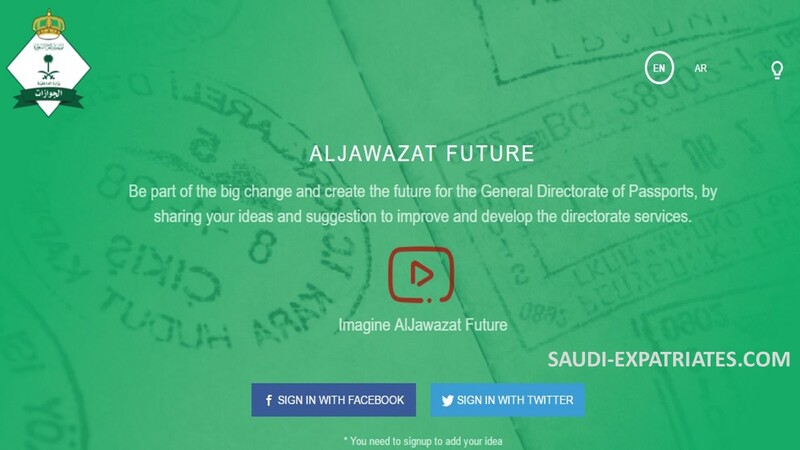 To share your idea or suggestion in English or Arabic, Click on the link "ALJAWAZAT FUTURE". 1. One should login through Twitter or Facebook network. 2. Click on "SHARE YOUR IDEA" button. 3. Write your ideas or suggestions. 4. Choose suitable category from "Passports, Absher, Resident, Administrative Affairs and Others".